What could change us from having to wrestle with physical devices? That was the question posed by Microsoft AI CTO Joseph Sirosh at the 2018 AI Summit in San Francisco. He was specifically referring to a prosthetic, but that is only an example of how Cloud AI Services could impact the usefulness of all devices. The most important macro trend is a cloud AI service behind every device. It might be a prosthetic, it might be any device that you use in your house. Of course, your apps on your phone have AI services behind them eventually, some of them already have AI, but others well. Everything in the world that is connected with Wi-Fi or Internet connectivity can now be backed up by an AI service. That’s very powerful and profound when you think about it. Now, think about this one, the grip classification (on a prosthetic). How it works is there’s a muscle sensor that I’ve attached to my arm here, there’s a camera in the hand. 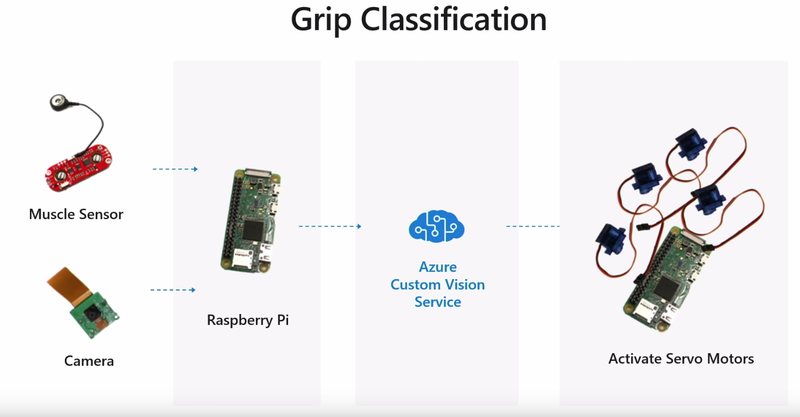 So, through the electronics, it goes to an Azure Custom Vision Service, where our classification model has been set up, a deep-learned model that recognizes objects and classifies it to the right action and then that triggers the appropriate grip classification in the Servo motors connected to an Arduino board in the arm. Two undergraduates built this. Hamayal Choudhry from the University of Ontario Institute of Technology and Samin Khan from the University of Toronto. They did this for the Microsoft Imagine Cup. They were the winners in 2018. Building this took them a few weeks. Of course, then the magic was provided by a cloud AI service to be able to make this device intelligent. That’s a power. Even an undergraduate can build something as powerful as this today. So, why is this revolutionary? Step back and think about this device. Look, there are over a million amputations per year. That’s an amputation every 30 seconds. WHO estimates that 30-100 million people in the world live with limb loss. Only 5 to 15 percent of these have access to prosthetics, even though prosthetic devices have been around since the Egyptian times. Even though these devices have been there, they have been purely physical devices and very severely limited. Limited by cost. The bionic arms that you have heard about today, they cost tens of thousands of dollars and it takes a lot of effort to fit them on you. They’re limited by availability, very few people have access to it, and they’re limited by the interface you can attach to the body. Above all, they’re limited by the nervous system that we have because we’ve got to train ourselves to use that device. In fact, literally, we had to force our will into these devices to be able to use them effectively. How could we change all of that? What could change us from having to wrestle with physical devices? How could we break these limits? The answer is an AI or a cloud AI service backing it up. Think about this, what if you had low-cost electronics to build with it? What if we could change the game of availability with 3D printing? So, you can print these things anywhere in the world. What if you had a Cloud AI service behind it that provided the ability to recognize things and make the movements? What if it could be personalized? What if it could be adapted? 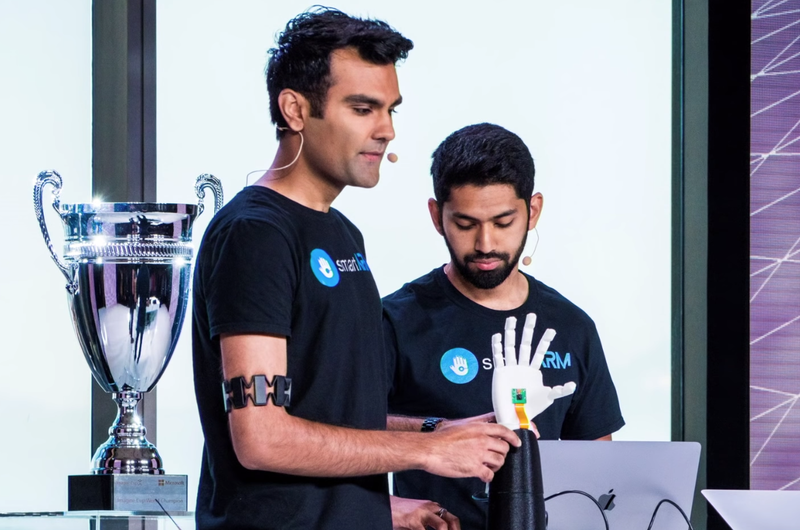 What if other people, your friends could train your arm to make the right kind of movements, in the right kind of environments? How could you have customizability of all types? What if you could tap into the knowledge of the world beyond our senses through the cloud service so that you can keep improving it? What if all of these things came together for a very low cost like the $ 100 it took for this arm to be built? That would be revolutionary, right? Imagine, now every prosthetic in the world or orthosis in the world which is, let’s say you break your arm and [inaudible] sling and you need assistance? What if you could get something very cheap that you could move around but it’s controlled by a Cloud AI service and all you have to do is express your intent to that Cloud AI service somehow and it does the more complex task of actually doing the grasp? See, this is the difference that the services can make. What you do is you express your intents and your constraints, and the service generates the behavior you need. So, it’s a generative service. The behavior is generated but from high-level intention that you communicate. So, the future is affordable, intelligent, cloud-powered, personalized, prosthetic devices and really devices of every type. That’s hugely revolutionary. Microsoft is gearing up for its yearly Inspire event and has drummed up interest with the announcement of a free version of Microsoft Teams. The Teams platform has been around since 2016 and 200,000 companies are now using it. However, the lack of a free version or a freemium tier and the $ 60 annual fee made it inaccessible to freelancers and small businesses. This oversight may have been costly, as small and medium businesses comprise more than 90 percent of businesses worldwide. Unlike Microsoft, Slack has had a free version of its service since its launch in 2014, which helped the work chat application gain a lot of attention and subscriptions. It’s better late than never as far as Microsoft is concerned, as the free version of Teams will include most of the features paid subscribers enjoy. Of course, these features have limits that will hopefully encourage people to sign up for an Office 365 subscription. The Teams free version boasts unlimited search and chat messaging and includes support for up to 300 people. It also has integrated audio and video group calling. Users also have unlimited app integrations, so they can add applications like Trello without fear. It will also have guest access and a limited file storage of 10GB. Each member will have 2GB of private storage. Microsoft is also introducing improvements like cloud recordings of meetings, inline message translation for members who speak a different language and background blurring for video calls. In contrast, Slack’s popular free version is limited to 10 app integrations, 10,000 searchable messages, and 5GB of storage. There are no options for guest accounts or group video chats, but one-on-one video chatting is offered. In short, Teams has fewer restrictions as long as you keep the team to less than 300 people. However, Microsoft is limiting full integration of desktop versions of Excel and Word to paid Office 365 subscribers. But users of the free Teams platform can enjoy the web versions of key Office apps from Office Online. The free version of Microsoft Teams is available now in 40 languages. Companies that have reached the limits of the app have the option to upgrade to an Office 365 subscription for as little as $ 5 a month per user. The post Microsoft Now Has a Free Version of Teams, Takes on Rival Slack appeared first on WebProNews. Microsoft is reportedly taking on Amazon, as the company ventures into retail territory. The company is said to be looking into checkout-free shopping, an innovation that Amazon has pioneered. Reuters reported that at least six people have talked to them about Microsoft developing technology that will give retail companies the option to have cashier and checkout-free shops. Microsoft is said to have partnered with fellow Redmond-based company AVA Retail. The company develops systems that can collate information about shoppers. This time around, it will be working with the renowned software company on innovations that could be used on brick-and-mortar stores. Interestingly, Microsoft will not be installing said technology in their own stores. According to the sources, it has instead reached out to Walmart about the possibility of a joint effort. If this pushes through, the two companies could give Amazon a run for its money. Microsoft is said to have around 10 to 15 employees working on researching and developing their new retail technology. There aren’t a lot of concrete details at the moment, but one report said the research team has explored using cameras attached to shopping carts as a means to track the customer’s purchases. If successful, this could potentially do away with the need for cashiers. It also means a store won’t need to put up hundreds of cameras the way that the Amazon Go pilot store did. This approach suggests that Microsoft is looking to offer retailers a more cost-effective system. Stepping into the checkout-free store arena would also pit the software company against retail giant Amazon. Heated competition between the two is nothing new. Microsoft’s Azure cloud service is second only to Amazon’s AWS. There’s no question that Amazon leads the way when it comes to changing the face of retail. If Microsoft or other businesses want to get ahead of the company, or at least be on the same standing as Amazon, they better get a move on. Amazon has already opened to the public its first cashier-less convenience store, Amazon Go, in Seattle early this year. Shoppers entering the store are required to swipe an app which enables computer-vision technology to monitor and track them and their purchases as they walk around the store. Once done with their shopping, consumers simply walk out and their purchases are charged via their Amazon app. The post Microsoft Ventures Into Checkout-Free Retail, Takes on Amazon appeared first on WebProNews. It’s likely that Nadella’s vision has impressed GitHub, opting to sell instead of going public. Although the terms of the deal remain under wraps, GitHub was reportedly valued at $ 2 billion in 2015. This was lower than its $ 5 billion asking price when acquisition talks were discussed previously, say sources familiar with the deal. GitHub posted losses of about $ 66 million for three quarters in 2016 but reported revenue of $ 98 million during the same year, according to Bloomberg. However, its annual revenue doubled to $ 200 million in 2017, driven mainly by its paying corporate accounts. The company began offering GitHub Enterprise, a paid option for corporations with additional features and services, such as 24/7 support, dynamic hosting alternatives, and private workspaces, among others. The post Microsoft is Reportedly on the Verge of Acquiring Github appeared first on WebProNews. Incidents of tech support scams targeting susceptible PC users are increasing, Microsoft warned. The company received 153,000 reported complaints from consumers in 2017, 24 percent higher than the prior year, according to its detailed security report released on Friday. Reported incidents came from 183 countries, suggesting a widespread global problem. Of those who fell prey to the scam, roughly 15 percent lost money averaging between $ 200 and $ 400. There were cases of victims paying significantly more. In December 2017, Microsoft was notified of a tech support fraud in the Netherlands that resulted in the financial loss of €189,000, or about $ 109,000. Called social engineering attacks, scammers use a variety of ways to initiate the fraud. Cybercriminals send phishing emails, display strategic online ads or full-screen error messages, install malware, or place unsolicited phone calls to convince victims that their systems or devices have been compromised. Once victims contact the call center for help, a fake technical support specialist instructs them to install remote administration tools (RATs). This allows fraudsters to have complete control over the device and unrestricted access to sensitive information. They make changes inside the device and point out system errors to convince victims of the ‘problem’. This then prompts unsuspecting consumers to pay for the removal of fake or nonexistent malware. According to Microsoft, the widespread problem is not limited to its platform but has affected users of MacOS, iOS, and Android systems as well. The FBI received 11,000 tech support fraud complaints in 2017 from 85 countries. Of these, claimed losses amounted to approximately $ 15 million, representing an 86 percent increase compared to prior year. The FBI also noticed an emerging trend: re-targeting past victims of tech support fraud. Scammers pose as government officials or law enforcement and offer assistance in recovering losses in exchange for fees. Other fraudsters act as collection services and threaten the victim with legal action for nonpayment of outstanding tech support fees. Some criminals use obtained personal information to commit additional fraud, such as unauthorized bank transfers or opening of new accounts for unlawful payments. Microsoft expressed concern over tech support scams that bypass secure platforms like Windows 10 easily and coerce users into giving unrestricted access to their devices. Because the problem is far-reaching, the company called for industry-wide collaboration and law enforcement partnership. Microsoft continues to form partnerships with web hosting providers, telecom networks, browser developers, antivirus solutions, and financial networks in detecting tech support scammers. The graphic below shows how the scam usual works. Customers, on the other hand, can protect and empower themselves through education. Be wary of error or warning messages with phone numbers or emails with malicious attachments. Shut down your device once you receive a pop-up message or locked screen. If you have been a victim, notify your bank to reverse the charges and change all your passwords. Uninstall any application used during the tech support and run a virus scan for remaining malware. The post Microsoft Warns of Rising Tech Support Scams, Calls for Industry-Wide Cooperation appeared first on WebProNews. The post Microsoft Previews New Privacy Controls for Windows 10 in Insider Test appeared first on WebProNews. It seems that Google is seriously eyeing a bigger slice of the workplace communications market. Recently, the company announced that Hangouts Chat is now rolling out to the general public which puts it on a collision course with rival Slack and Microsoft Teams. Hangouts Chat was first announced in March of 2017 and was previously available as part of an Early Adopter Program. However, the feature is now making its way to all users over the course of seven days starting yesterday. Google is positioning Hangouts Chat as the perfect tool to handle the communication needs of companies especially those that require team members from different parts of the globe to collaborate. The feature, which can be accessed by all G Suite users, supports 28 languages while each room can even accommodate up to 8,000 members. Chat also allows plenty of customization options so that companies can tweak the tool to suit their specific needs. For instance, developers may build bots or integrate their services into the feature. The feature is also compatible with Google’s existing ecosystem of partners making it easier for the tool to be integrated with other workplace collaboration apps such as Xero, RingCentral, UberConference, Salesforce, Zenefits, Zoom.ai, Jira, Trello, Wrike, and Kayak. Of course, Hangouts Chat is very compatible with Google’s own suite of products and workplace tools. From Chat, users can easily start Hangouts Meet video conferences as well as document and file sharing. The rise of online jobs, as well as teams of workers opting to work remotely, has spawned a new segment of services catering to the collaborative and communication needs of modern day businesses. As a newcomer, Hangouts Chat needs to put more effort to catch up with more established players in the market. At the moment, Microsoft Teams has a 37 percent share of the global market collaboration software while rival Slack has 5 percent share. The post Google Rolls Out Hangouts Chat, Set to Compete with Slack and Microsoft Teams appeared first on WebProNews. Microsoft has been pretty aggressive in marketing its Edge browser and even launched two commercials earlier this year specifically pointing out its advantages over rival Chrome. After being silent for a while, it appears that Google finally counterattacked by disclosing Edge’s security flaw. Google’s Project Zero, which found the vulnerability last November, h released the technical details of their discovery. Due to the existence of the flaw, it is theoretically possible for hackers to bypass Edge’s security features and insert their own malicious code into their target’s computer. While indeed a possibility, it must be noted there has been no reported instance of the problem being successfully taken advantage of by hackers so far.